November is the start of a fun time here in Germany for festivals as the Christmas Markets start! 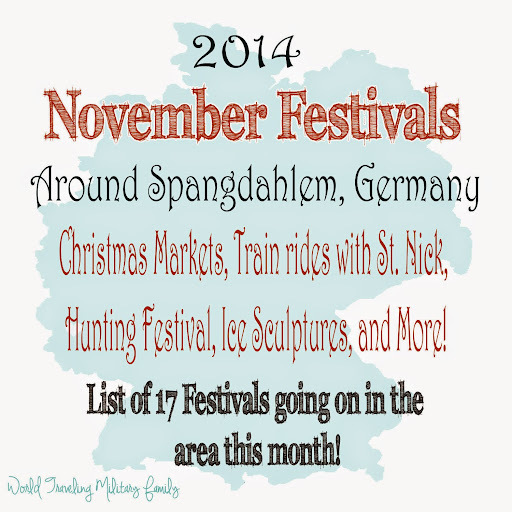 This will be a list of November Festivals and Events, there are many to chose from, this list has 17! We had a great time checking out the October Festivals, if you missed them add them to your calendar for next year. Again these are generally no more than 3 hours away, although I may throw in one or two further away ones if I think that they are something to consider. There are festivals for everyone! From Hobbit ice sculptures, Hunting Festivals with game to eat, to endless Christmas Markets! There has got to be one that you will find interesting and want to check out! I’ve also included a printable file at the bottom so that you can print it out and easily see what festivals are available. Some of the festivals are this weekend so if you don’t get to them this year you can always add them to your list for next year. I’ll also be blogging about the ones that we get to visit so check back and see if they are worth taking a trip to. 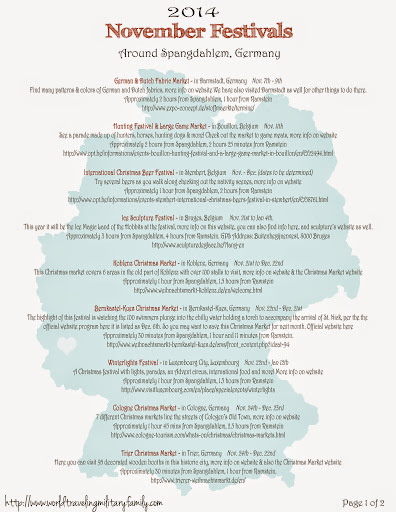 Below is a list of upcoming festivals, please note many of the websites are in German only so use Google Chrome and it will translate the page for you. It will include the festival, website, dates, and how far from Spangdahlem. Please note these are just some of the bigger festivals there will be TONS of Christmas markets and I’d be here all year if tried to list them for each village. Find many patterns & colors of German and Dutch fabrics, more info on website We have also visited Darmstadt as well for other things to do there. Ice Sculpture Festival – in Bruges, Belgium Nov. 21st to Jan 4th. This year it will be the Ice Magic Land of the Hobbits at the festival, more info on this website, you can also find info here, and sculpture’s website as well. Approximately 30 minutes from Spangdahlem, 1 hour and 11 minutes from Ramstein. Approximately 30 minutes from Spangdahlem, 1 hour from Ramstein. Approximately 1 hour 40 minutes from Spangdahlem, 40 minutes from Ramstein. Cochem Christmas Market – in Cochem, Germany Nov. 27th to Dec. 21st. Winter Wonders – in Brussels, Belgium Nov. 28th – Jan 4th. This a neat little Christmas market that is close to the base, we visited it last year, you can read about it HERE, more info on website (use Google Chrome). Approximately 6 minutes from Spangdahlem, 1 hour and 16 minutes from Ramstein. We will be checking out the some of these, I’m excited about crossing some of them off our list! If you know of a great festival that I missed that you think should be added please email me or leave a comment 🙂 I’d also love to hear your experience if you get a chance to visit any of the festivals!